Architect and historian Michelangelo Sabatino considers the rhizome, a plant system utilizing both vertical and horizontal roots, as a perfect visual metaphor exemplifying specificity and interconnectivity as two separate but equally important concepts that make for a holistic educational environment. 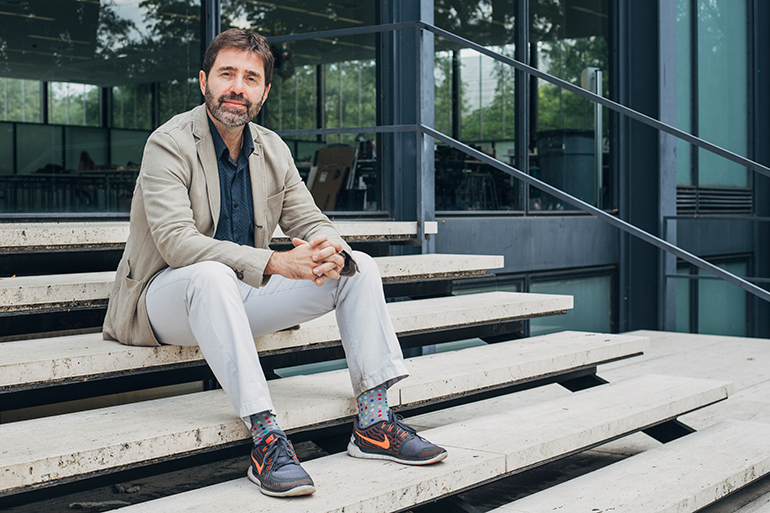 On the Illinois Tech faculty since 2014 as professor and director of the architecture Ph.D. program, Sabatino considers his vision for the college now as interim dean of the College of Architecture. seek to re-think the relationship between our college, IIT, Chicago, and the rest of the world. We are more powerful if we identify opportunities where we can collectively be more impactful as a college of architecture by way of strategic collaborations with the Institute of Design or Armour College [of Engineering], for example. While the very nature of education is specialized, the learning process does not stop at colleges. I am a big proponent of the built environment. When you say ‘architecture’ instead of ‘built environment,’ you’re putting all of the agency on the architect; whereas we all know that architects are hugely important in many aspects leading up to the design, you need great collaborators in engineers, landscape architects, urban planners (just to name a few), in order to make anything really work. So I would stress built environment over architecture with a capital A. That’s a bit of a provocation, I understand. But when you think about it, roads and infrastructure are equally as important as the buildings. We have various degree programs in the College of Architecture, but we also have the M.L.A. + U [landscape architecture and urbanism] program. When we talk about the legacy of the College of Architecture, I think we tend to give almost too much importance to [Ludwig] Mies [van der Rohe]. He was certainly an innovator of huge impact, but he was also a man who collaborated. Three greats have influenced us at the school—Mies, Ludwig Hilberseimer, and Alfred Caldwell. Lafayette Park—a residential neighborhood realized in Detroit during the late 1950s and 1960s—is the result of a collaboration between them. My ambition is to think carefully about what it means to be a global architect today. To be a global architect you actually have to experiment with a local context that you learn from to apply your skills to other contexts. Take, for example, when Mies came to this city. Gary, Indiana, was a huge producer of steel. It was not only that Mies loved steel as an aesthetic, but the proximity to Gary also made the choice affordable. If one thinks of a building only in terms of aesthetics, you really don’t understand the context. Mies learned from America, and America learned from him. Being in Chicago was hugely important for him—he used what he learned in Europe, took it forward, and increased his oeuvre.